With the recent spike of interest in GPU mining thanks mostly to Ether a lot of people are getting back to building GPU mining rigs using more up-to date hardware much like back in the days of the Litecoin and prior to that of the Bitcoin mining boom. Nowadays it is much easier and you have way more options for different motherboards that have the option to work with 4, 5 or even 6 video cards by utilizing not only full width x16 PCI-E slots, but also the multiple available PCI-Express x1 sots with the help of extenders. We have prepared a list of all possible candidates for use as motherboards for multi-GPU mining rigs 4-6 GPU mining from ASRock, the company that has made its name among miners thanks to their dedicated BTC-branded motherboards made especially for GPU mining rigs. Other motherboard manufacturers such as Asus, Gigabyte, MSI and others also have products that might do for a multi-GPU mining rigs, but these are not dedicated for such use and this may cause some problems. Nowadays ASRock has a lot of BTC-branded motherboards that are designed for use as multi-GPU mining rigs for different processor platforms from both AMD and Intel. There are also quite a few more non-BTC named motherboards that could do the job perfectly and some that might also work fine, but some of the PCI-E slots might not be available for GPU use under specific conditions, so you need to be careful. What is important for a motherboard that will be used with multiple GPUs for mining is for the motherboard to have enough PCI-E slots, to be affordable in terms of price as you don’t need extras targeted at gamers or enthusiasts and to be able to be used with cheap dual-core CPUs. 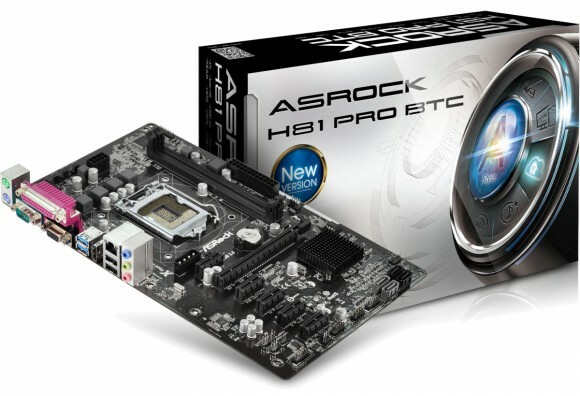 ASRock’s BTC-branded motherboards do come with some extra features that may help by minimizing possible issues such as the fact that they have been designed to provide extra power to GPUs and have dedicated connectors for additional power from the PSU. They do not share PCI-E lanes with external hardware such as network controllers, audio cards, storage controllers or USB controllers that may cause problems if you want to use all of the available PCI-Express lanes for video cards and so on. These motherboards are offering just basic features, but ensure stable and problem free operation even under not so good conditions that often are available with GPU mining rigs that generate a lot of heat an may not be optimally cooled. The list below covers all possibly suitable ASRock motherboards for 4-6 GPU mining rigs, you should choose to go for the models that do have the BTC in their model nae as they will most likely be the best choice. The next are Anniversary and Pro series and then the others if you have no other choice, but with such a big list you should have a lot of options. Unfortunately the only 6 GPU capable motherboards are for Intel socket 1155 and 1150 CPUs, still no affordable options for the latest Intel 1151 platforms or AMD FM2 sockets. Sure the company has some high-end enthusiast level products that can do 6 GPUs, but these are pointless for use as multi-GPU mining rigs as they will add to much to the price of the setup and you will be better off spending the extra cash for more video cards or more powerful models. After all you need to find the right balance that includes cheap motherboard, cheap processor and powerful GPUs along with some PCI-E extenders (powered preferably) with PCI Express x1-x16 USB 3.0 Extenders being the best choice if available.